Beetroot is an autumnal delight, although seasonally, it blooms in the summer, the deep reds and naturally darker shades make it the perfect vegetable enjoyed in the cooler months. 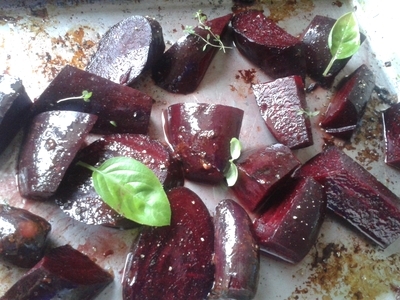 Beetroot is excellent for growing kids, as well as adults. 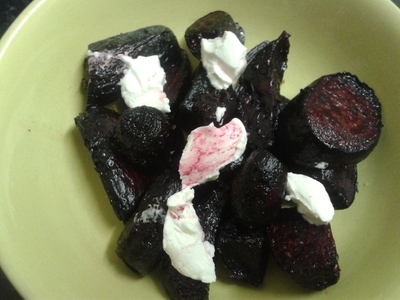 Turn baby beetroot into a loved snack by giving it a little attention, and your kids will soon be asking if they're having beets for dinner. 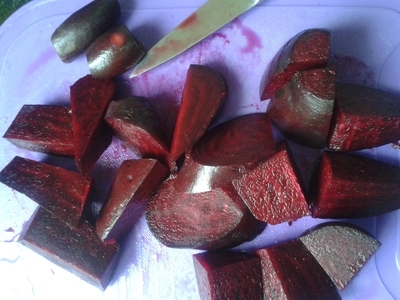 In a bid to save waste, and make the most of the natural juices, I bake baby beetroot in the juices which are left at the bottom of a tray from roasting meat. 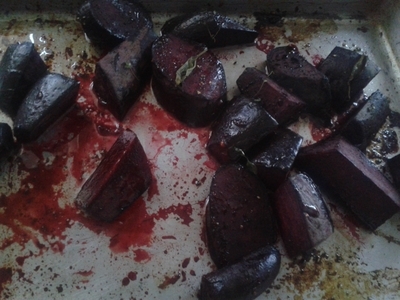 In this instance, I cooked the beets in the same juice a joint of turkey was roasting in, but beef, chicken, lamb, or pork, will do just fine. 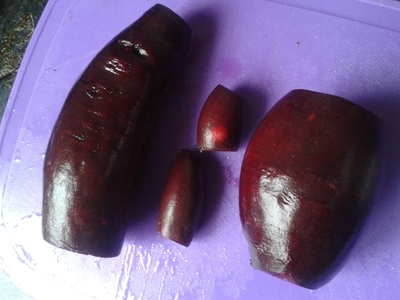 When preparing the beetroot keep little ones out of the room because the red juice will stain anything and everything in its path, which is a bit of a nightmare to get off magnolia walls, and clothes. 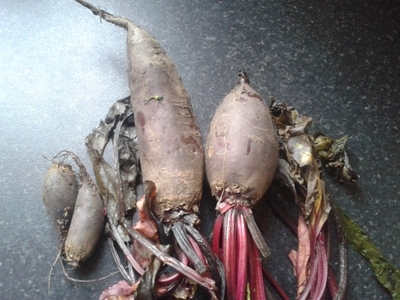 Scrub the beetroots and wash.
Leave the tiny bulbs whole, but halve and quarter the larger bulbs. Add to the baking tray which has the leftover meat juices and oils. Season and place in the oven for 1 hour at 150 degrees/ gas mark 2. Remove from the oven after 30 minutes, toss and replace back in the oven. 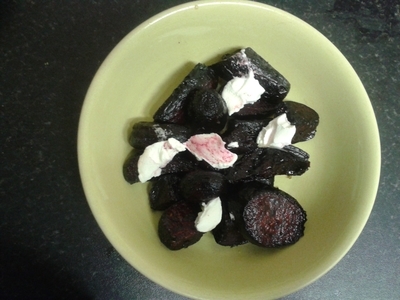 Remove the beetroot from the oven and place in a large bowl. Add a few nuggets of cream cheese for prettiness and added texture. The beetroot will have an earthy, yet slightly herby fragrance, which works well alongside any vegetarian or meat dish. 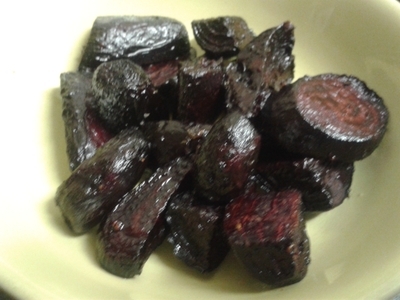 And baby beets are especially sweet when paired with chicken, for a delicious, and healthy side dish. You'd be surprised at how much little ones love this dish. 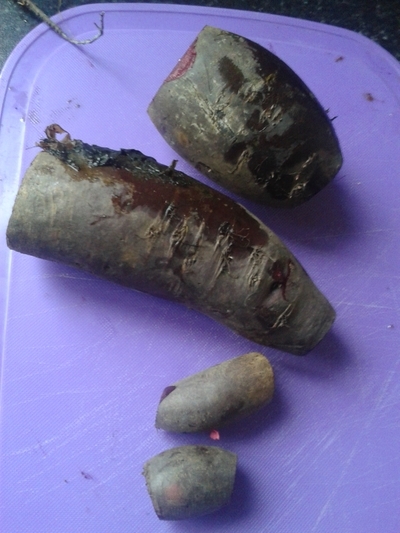 Although roasted, the beetroot still stains teeth and fingers, if you're not careful, and whose kids are careful? 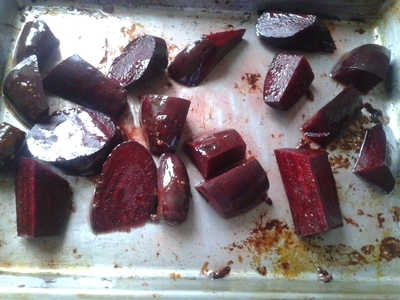 Plus the slow roasting makes the beetroot sweet, like roasted carrots because the natural sugars caramelise during the cooking process.